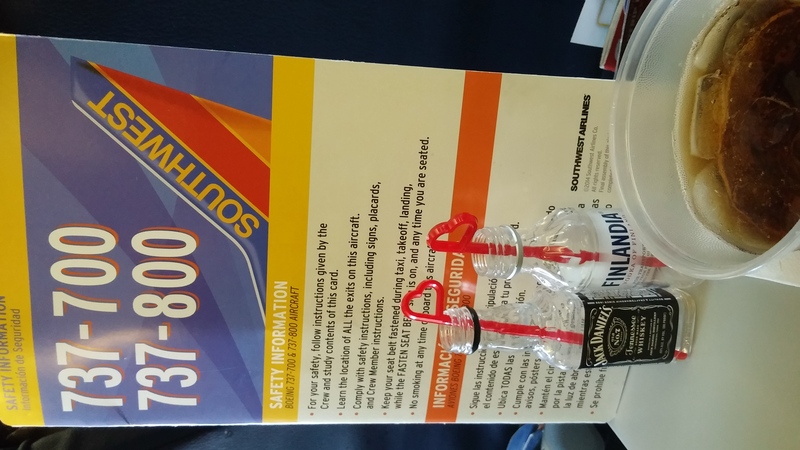 My inaugural post for the flight reviews page has to begin with Southwest Airlines because I fly it domestically more than any other airline. I have had the good fortune to have a companion pass on Southwest for what will be three years and enough Rapid Reward points to only pay the TSA tax (which is going up as of today). Southwest has no business class, no lounge asccess, and there is no champagne, but there is free on-demand TV if you want to want to watch International House Hunters on Dish (with in-flight Wi-Fi for normal web browsing only costing $8 per flight). There are complimentary drinks and snacks. Wine, spirits, and beer are available for $5. Vitamin Water is $3. Specifically, I will be reviewing what may be the best route in the entire United States- Phoenix to Las Vegas, a flight path I know far too well. SWA flys about a dozen nonstop hour long flights daily to Sin City on the standard Boeing 737. My only gripe with Southwest is the unassigned seating because I always forget to check in exactly 24 hours before I take-off. This is annoying if you are stuck in a middle seat flying from Phoenix to Newark because the flight time is 5 hours. Even on cross country flights, the seat size is not too uncomfortable in comparison with other US commercial airlines. However, if you do get the dreadeed C60 seat assignment on the way to Vegas, fear not. It means that you will end up sitting in the middle next to two strangers who are just as excited as you are to make the trip. The flight attendants are as happy as can be as they serve you a welcome cocktail, most likely free from a drink coupoon. Try to schedule a flight that gets you into Vegas at night because the strip lit up on approach to McCarran airport rivals any international skyline. Don’t worry, if you scheduled a day flight, Southwest does allow changes with no fees. I will not be reviewing any other Southwest flights because they are all the same. And that’s a great thing! Gotcha. Thanks for the clarification. We were planning on bringing our own devices anyways but that is good to know. Excellent! Our family of 8 is going to be taking our first flight together on Southwest later this summer. I thought that they did have some kids shows on the free DirecTV as well? Dish is free, formerly known as Dish Network but if you want normal Wi-Fi for web browsing you have to pay. I should add that you do have to bring your own iPad etc because they don’t have TV’s in the headrests. Fixed it! Thanks, that wasn’t as clear as I wanted it to be.